Our 3-hour walking tour of historic downtown Charleston has left us famished! Luckily, Charleston has many well-known, locally owned restaurants to choose from. One that everyone told us to visit was the ever-so-hip Leon’s Fine Poultry and Oyster Shop. 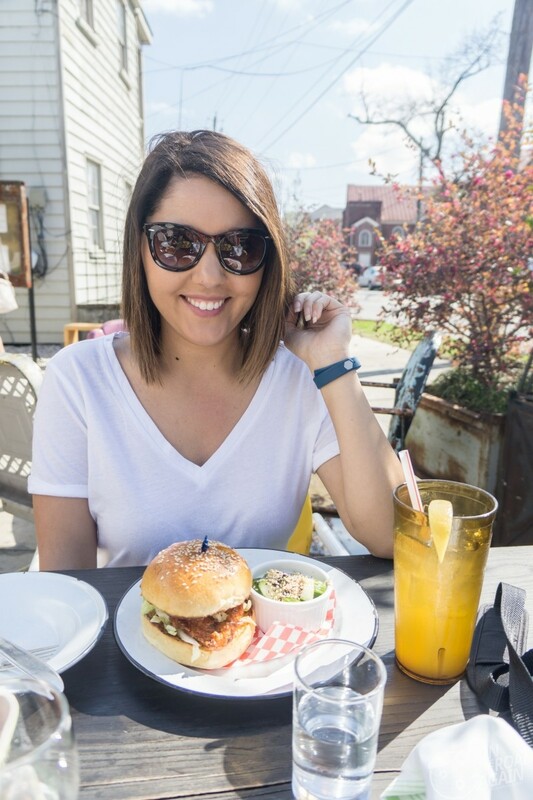 With the weather as fantastic as it is, we choose an outside table. Whitney and I pulled up our metal chairs (the kind your grandmother would have on her front porch) and got to work on their menu. If you like things fried, you’re in the right place. 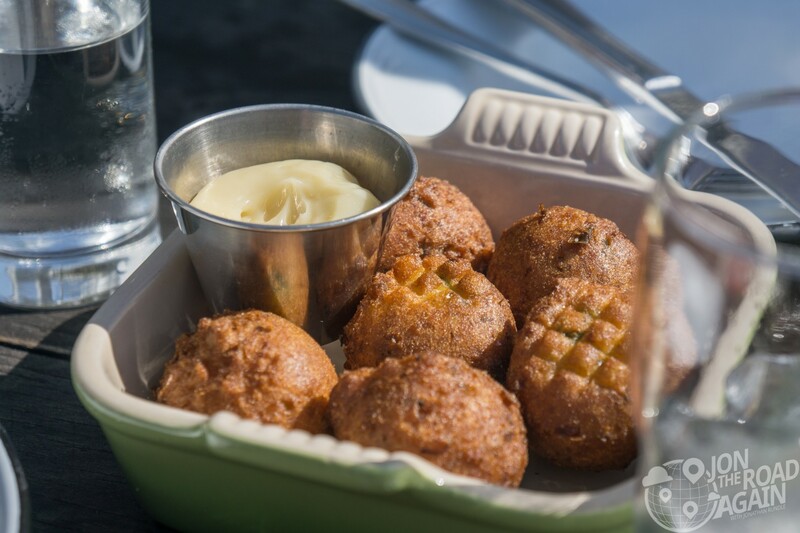 We were told on our walking tour that hush puppies got their name from the southern households who would fry them up to throw outside to barking dogs to keep them quiet. Fact or fiction? Who knows. One thing is for certain, these little deep fried goodies with their honey butter kept us quiet. Being a coastal city, I chose something of the sea. Fried shrimp it is. The breading is perfectly adhered to the lil shrimpies and the tartar is smooth and tangy. Can you tell I’m not a food blogger? Anyway how about a photo? Whitney went with the fried chicken sandwich. It looked so crispy and tasty. She loved it. It came with a side of cucumber salad and a heavy handful of sesame seeds. Fried chicken is in the name of the restaurant, so I would assume they know what they’re doing. 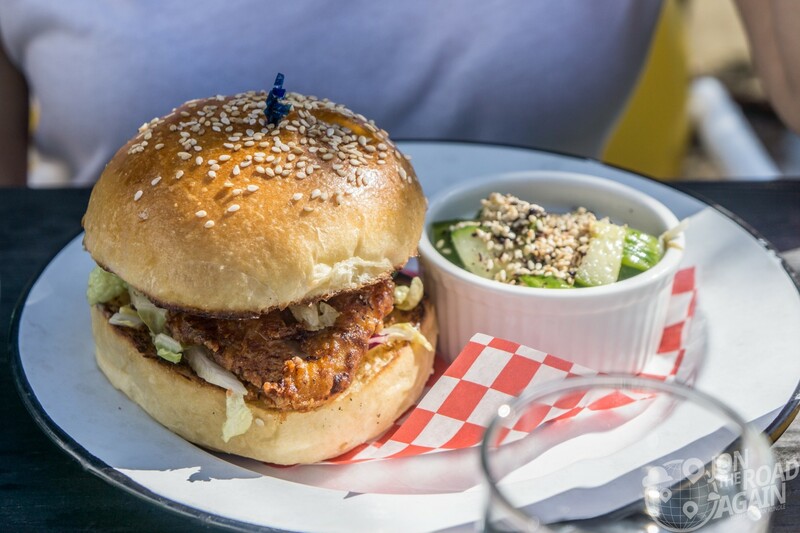 We, and countless reviews show that you need to try the fried chicken. 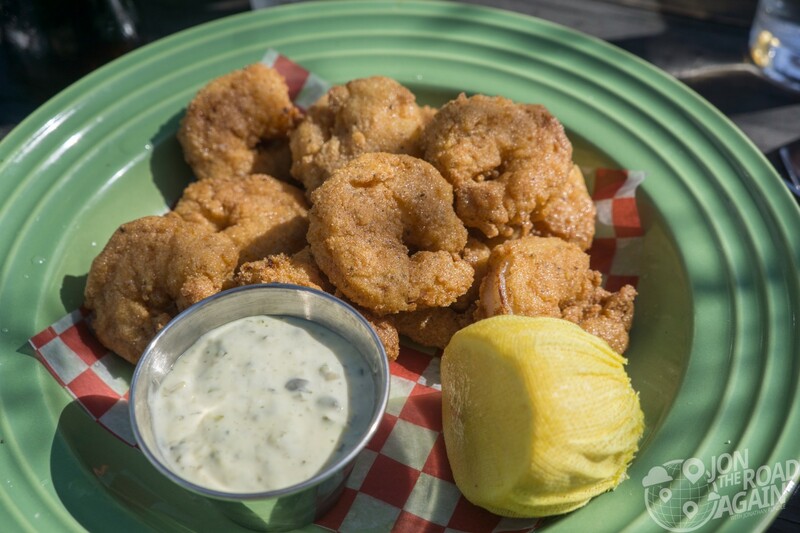 Vacation, sun, and fried food—we are happy campers. Leon’s is a great escape from the touristy core. Leon’s is in north-central Charleston. From the south, follow King street past I-26. There is some off-street parking available nearby. No reservations. Visit their website. They’re open daily 11 am – 10 pm, 11 pm on Friday and Saturday. Passed it many times, but never ate there.Glad it was good . Looks wonderful !!! !